I finally got Matt to try Soyrizo! He did not want to (he did not like chorizo growing up), then I made him tacos with it last week, he liked it a lot so they appeared in this weeks menu as well! Simple and cheap, I place a few chopped potatoes in a pan with olive oil, cover and heat on medium-low for 15 minutes till the potatoes are about fork tender. I then add the Soyrizo, stir them and give them another 10 minutes to cook. I first had chorizo in 7th grade in home economics. It was not a staple in my house or something I saw a lot of so I did not really have lots of experience with it. 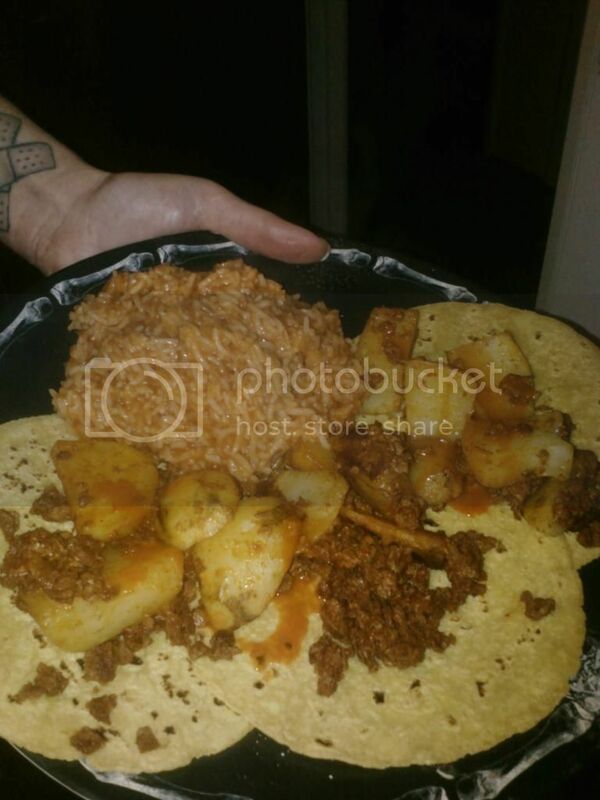 I do love Soyrizo though, in scrambled tofu, in chili or with fried potatoes! It is tasty! A lot of meat-eaters grab Soyrizo over chorizo, because the health factor and no one wants to eat really crappy-scary processed parts! When I worked at the mall years ago a taco stand would make me a potato and salsa burrito in the morning. It is something I still love to eat. I grew up with fried potatoes and I cannot eat a baked potato without hot sauce so they just go well together! I am hungry now!!! I am hungry now too. And I dig soyrizo. Thanx for reminding me I haven't had it in a while. Your way is such a great way to prepare it. I have a recipe on my blog called "easy peasy" and it's made with soyrizo.